The Chicago Wolves clinched the American Hockey League’s Central Division title and the division’s top seed for the 2018 Calder Cup Playoffs on Friday night with a 6-4 victory over the Rockford IceHogs. The result also locked in Rockford as the division’s No. 4 seed, which means the Wolves and the IceHogs will meet in the best-of-five Central Division Semifinals. The Wolves own the home-ice advantage and will host Game 1 at 7 p.m. on Saturday, April 21, at Allstate Arena. It’s the first time Chicago and Rockford have met in the postseason since 2008 — when the Wolves took the Western Division Finals in seven games on their way to the Calder Cup championship. Game 1 – Saturday, April 21, 7 p.m.
Game 2 – BMO Harris Bank Center Sunday, April 22 4 p.m.
Game 3 – Thursday, April 26, 7 p.m.
To celebrate the return of postseason hockey to Chicago, there will be free parking at Allstate Arena during the first three rounds of the Calder Cup playoffs and the arena’s concession stands will feature $3 beer, $3 hot dogs, $3 pretzels, $3 sodas and a $6 burger/chips/soda combo during the first round. 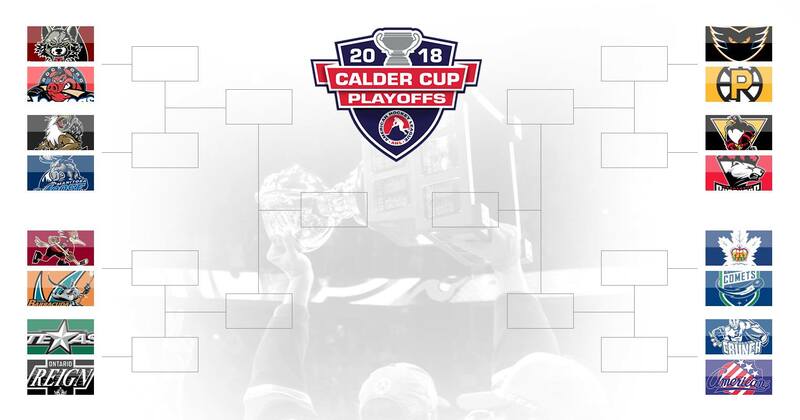 Four teams in each of the AHL’s four divisions qualify for the Calder Cup playoffs that begin next week. The winner of the Chicago-Rockford series will meet the winner of the Manitoba-Grand Rapids series in the Central Division Finals. For information on Calder Cup tickets, visit ChicagoWolves.com/playoffs, ticketmaster.com, or call 1-800-THE-WOLVES.